Most Britons describe themselves as Christian despite not attending church regularly, a BBC survey has found. The poll taken for BBC News 24's Faith Day examines how belief in religions is shaping British identity. More than two-thirds of the 1,019 respondents said they were Christian, but only 17% regularly went to church. Almost 75% of respondents said the UK should retain Christian values - including 69% of Jews, and nearly 50% of Muslims, Sikhs and Hindus. A fifth of people polled say they feel less positive about Islam since the London bombings on 7 July. More than a third said they had no understanding of Islam - but three-quarters said their views had not been changed by the suicide attacks. BBC News 24 interviewed a representative sample of the population for Monday's day of programmes examining faith in modern Britain. According to the poll, some 67% of those questioned described themselves as Christian - 59% of men and 75% of women. The next largest religious group was Muslims, making up 3% of respondents. More than a fifth of people said they did not believe in any religion. Among the general population, 14% said they attended a religious service once a week or more, while 60% attended at least once or twice a year. Some 28% of people said they never attended a service. Find out more about the BBC News 24 poll. When asked if they felt more or less positive towards Islam since the 7 July bombings, 73% said it had made no difference to their views - but 19% said they now felt less positive. Broken down by religious belief, the two groups showing the least positive feelings towards Islam were Jews and Sikhs. 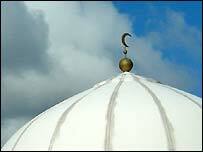 However, approximately a third of Jews and Christians interviewed said they generally had "positive" views of Islam. About 35% of all people said they did not understand anything about Islam as a faith, although similar or higher numbers of people said the same about other faiths. Some 44% of those who said they had no faith agreed that the UK should retain a Christian ethos. More women than men thought that Christianity was important to Britain. Muslims are the most likely believers to attend a weekly religious service, the poll suggests, with 38% saying they went to a mosque every seven days, Friday being the traditional day of prayer. BBC POLL: WHICH RELIGION DO YOU BELONG TO? In contrast, Jews were the least likely to attend services - just over half said they never went to a synagogue. Many policy-makers remain concerned about dialogue between Jews and Muslims, and the poll suggests that contacts between the two faiths are haphazard. Jews were found in interviews to be the least likely to know anything about Islam - while 37% of Muslims said they knew nothing about Judaism. Significantly, 31% of Jews said they knew nothing about their own faith, indicating people born into Jewish families but having chosen not to follow the faith. ICM Research interviewed a random sample of 1,019 adults by telephone for BBC News 24. The interviews took place between 4 and 6 November 2005. Interviews were conducted nationwide and weighted to reflect the national profile of adults. How would you describe the UK?